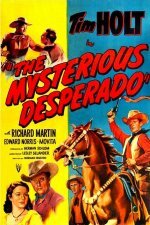 Tim Holt's second RKO western for 1949 was Mysterious Desperado. Once more teamed with Richard Martin as his saddle pal Chito, Tim rides into a sleepy California town, where Chito hopes to claim his uncle's estate. Tim decides to stick around and investigate when it turns out that Uncle was murdered. The number-one suspect is the victim's son (Edward Norris), but if this were true, the movie would be over in 15 minutes. A clue: when in doubt, always look towards the Evil Land Developers.